Pityriasis rosea is a mild skin disorder common among children and young adults, manifesting initially as a single round spot on the body and followed later by a rash of colored spots on the body and upper arms. Pityriasis rosea is most common in young adults and appears up to 50 percent more often in women. The condition occurs most often in spring and fall and can occur in epidemics within dormitories, army barracks, or other locations where young people live in close proximity to each other. It is unclear whether pityriasis rosea is contagious. Although some experts suspect the rash may be triggered by a virus, no infectious agent had, as of 2004, been found. Some scientists believe that the rash is an immune response to some type of infection in the body. 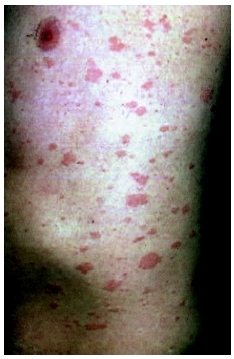 Torso covered with pityriasis rosea. It often appears on the torso and upper parts of the limbs of young people and may be contagious. Sometimes, before the symptoms appear, people experience preliminary symptoms, including fever , malaise, sore throat , or headache . Symptoms begin with a single, large round spot called a herald patch on the body, followed days or weeks later by slightly raised, scaly-edged round or oval pink-copper colored spots on the trunk and upper arms. The distribution of the spots, which have a wrinkled center and a sharp border, sometimes resemble a Christmas tree. They may be mild to severely itchy, and they can spread to other parts of the body. Although the diagnosis is usually obvious, if there is any confusion, other conditions (such as a fungal condition or syphilis) can be ruled out through examination of skin scrapings or blood tests. The rash usually clears up on its own, over the course of about 12 weeks. During that time, external and internal medications may be given for itching and inflammation. Mild inflammation and itching can be relieved with antihistamine drugs or calamine lotion, zinc oxide, or other mild lubricants or anti-itching creams. Gentle, soothing strokes should be used to apply the ointments, since vigorous rubbing may cause the lesions to spread. More severe itching and inflammation is treated with topical steroids. Moderate exposure to sun or ultraviolet light may help heal the lesions, but patients should avoid being sunburned. Soap makes the rash more uncomfortable; patients should bathe or shower with plain lukewarm water and apply a thin coating of bath oil to freshly-dried skin afterwards. These spots, which may be itchy, last for three to 12 weeks. Symptoms rarely recur. After the rash has cleared up, parents often notice that areas where there were spots may appear lighter (hypopigmented) or darker (hyperpigmented) in color than the surrounding skin. Hypopigmentation can be particularly obvious in darker skinned patients. These skin changes will resolve within weeks to months after the rash has cleared. Steroids —Hormones, including aldosterone, cortisol, and androgens, that are derived from cholesterol and that share a four-ring structural characteristic. "Disease of the Epidermis." In Nelson Textbook of Pediatrics. Edited by Richard E. Behrman et al. Philadelphia: Saunders, 2004. "Psoriasis and Other Papulosquamous Diseases." In Clinical Dermatology , 4th ed. Edited by Thomas B. Habif. St. Louis, MO: Mosby, 2004. American Academy of Dermatology. 930 N. Meacham Road, PO Box 4014, Schaumburg, IL 60168–4014. Web site: http://www.aad.org.